Corvette lovers are a breed apart. There are car enthusiasts, and then there are Corvette owners, whose devotion to their machine knows no bounds. Corvette Restoration Manuals, Guides and books are available at The Motor Bookstore for the ponycar aficionado who wants to embrace owning a 'vette from every conceivable angle. Any Corvette built from the model's inception in 1953 can be properly overhauled and restored by following the guidelines, instructions and diagrams in these volumes. Find out about all the inner workings of the suspension, wheels, tires, driveline, engine and braking system. All the chapters in each manual come with helpful tables, graphs, photos and illustrations that are easy to follow and understand. Read about body and interior restoration, and save time and expense with intricately detailed descriptions. 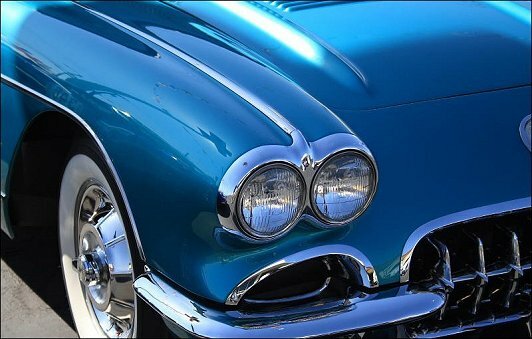 Below: Mike Green, a film production student at UNLV, took this great photo of the front end of a beautiful deep-blue classic Corvette at a car show in Las Vegas, Nevada.